1. Fry tortillas until crisp and lightly brown. Place on serving plate. Divide refried beans and top evenly across each tortilla. 2. In same skillet, cook eggs, sunny side up. With large spatula, place one egg on top of the refried beans on each tortilla. Top with 1 tablespoon each, salsa, sour cream and guacamole. 3. Serve with warm corn tortillas on the side. 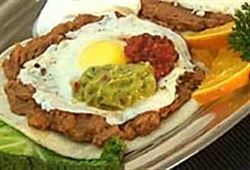 Enjoy this delicious huevos rancheros Mexican food recipe!